A new study claims that 60 per cent of British men are using the World Cup as an excuse to purchase an additional high-def screen to allow them to watch the beautiful game in future. The study, commissioned by Lenovo, claims that 16.5 million British men (58 per cent of the adult male population in the UK) think that they should be able to persuade their partners of the need to invest in a new all-in-one HD PC. Lenovo informs us that its new study, looking at the activities and habits of British families, "also found that nearly half (42%) of women agreed that there would be fewer remote control battles at kick-off if there were an additional HD screen in the home. "With 33 million (54%) families housing their main PC in the living room, this compromise ensures avid football fans can enjoy all the action, whilst still in the comfort of their favourite armchair, and without encroaching on their partners soap watching time." The Lenovo study adds that the average Brit now spends over 30 hours per week online, adding, "that the study surprisingly revealed that some of this time is being used to participate in traditionally solitary activities, as a family, with over 3 million visiting social networking sites together." Lenovo has constructed a handy table to illustrate and compare computer-using activities carried out as a family in England, Germany and France, which you can see above right. James Pank, Product Channel Sales, Lenovo, commented on the study's findings: "With digital lifestyles on the increase, it's great to see so many families continuing to take part in activities together. 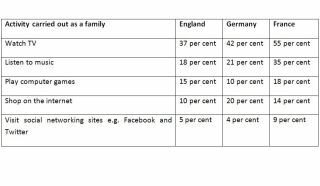 Social networking, gaming and internet shopping make up 30 per cent of family time in the UK and now rival traditional activities such as watching TV. "While in the past families may have enjoyed shared activities such as radio, television and board games, it's clear that in the digital world family activities are still the heart of the home." This latest PC-using trends study from Lenovo is part of the PR push to launch the new Lenovo IdeaCentres A310and B500 all-in-one PCs for the home.